Angel Cake Pan. 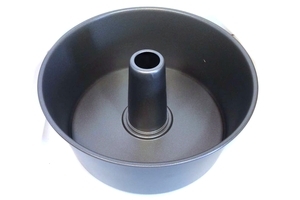 An Angel Food Cake Pan is a round, one or two piece, baking pan with a center tube, designed to promote even baking and uniform rising for baking an Angel Food Cake. The two piece pans often have a removable bottom to more easily free the spongy cake without the risk of its falling. Aluminum Angel Food Cake Pans are the best because the aluminum distributes the heat evenly and quickly across the batter. Non-stick interiors may risk having the baked cake fall. Some Angel Food Cake Pans come with feet, so that the elevated Angel Food Cake can cool more quickly once it is out of the oven. Product of Indonesia.